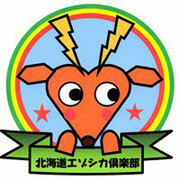 ◇◆◇Club's Profiie - "Hokkaido Venison Promoting Club"
The Hokkaido Ezoshika Club has　established (by volunteers) to solve Ezoshika(Japanese deer)-related problems. The number of Ezoshika has been　increasing because of the disappearance of their enemies like　wolves,deforestation, and other farm activities. Furthermore, Ezoshika’s breeding　coefficient is surprisingly high. This means shortage of food for　them. It inevitably leads them to move　to residential areas. The damage brought by them has　extremely affected farmers and foresters alike. The number of railway and car　accident has also been increasing. If we don’t take　appropriate actions, the situation will get worse. Ezoshika has been considered as　a harmful animal but venison is highly nutritious. If people become interested in　it and come to like it as a delicious meat, venison can be one of the signature　foods in Hokkaido. Our final goal is “a 300-gram　venison consumption per person annually”. *We conduct　seminars to let people know more about the increasing number of Ezoshika and　its negative effects. In addition, we showcase how　tasty venison is. *Cooking　classes will be held to make venison more popular among locals. "Hokkaido Ezoshika　Club" C/O "Sapporo Consumers Association"
3-28, Kita-ku, Sapporo, 060-0808, Japan.